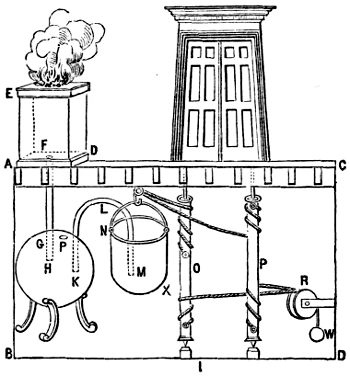 When his writings on hydraulics, pneumatics and mechanics were translated into Latin in the sixteenth century, Hero’s readers were amazed to discover descriptions of inventions which included vending machines, a water-pump, a wind-organ, and the aeolipile (the first recorded steam engine). 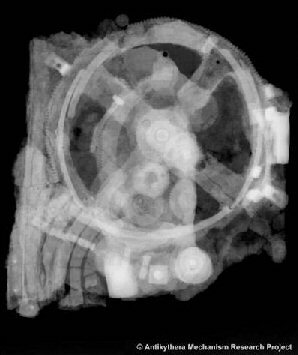 Although today the only surviving example of such sophisticated ancient Greek mechanics is the Antikythera mechanism (right), it is clear that complex mechanical devices existed in ancient Greece. The following examples leave no doubt that the ancient Greeks had taken the first steps towards mechanisation. 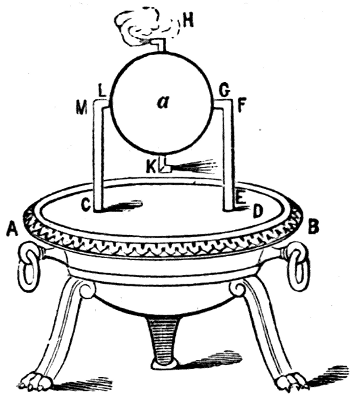 Whilst it is true that many of descriptions of automata are for objects of curiosity or whimsy, the Antykithera mechanism, Dioptra and Odometer are scientific instruments, demonstrating that their discoveries had also begun to be utilised in a functional capacity, such that one is left to wonder what the path of a mechanised Greek empire would have been given the chance to continue. The Greek God Hephaestus was the god of Metallurgy amongst other things. Greek mythology says that he was supposed to have built automatons to work for him in a workshop. He was said to have made metallic statues of animal, men and monsters crafted and made animate by the divine smith Hephaistos. Talos: Perhaps his most well-known mechanical man was a bronze giant named Talos. In the story Argonautica, Talos guards the island of Crete by tossing boulders at any unfriendly ships that approach. The legend has it that Talos had a vein that ran through his body filled with a blood-like fluid and sealed with a nail. When the nail was removed, the fluid ran out and Talos was destroyed. The Golden Tripods of Olympus: "[Hephaistos] was sweating as he turned here and there to his bellows busily, since he was working on twenty tripods which were to stand against the wall of his strong-founded dwelling. And he had set golden wheels underneath the base of each one so that of their own motion they could wheel into the immortal gathering, and return to his house: a wonder to look at. These were so far finished, but the elaborate ear handles were not yet on. He was forging these, and beating the chains out." The Hippoi Kabeirikoi: These were four horse-shaped automotones crafted by the god Hephaistos out of bronze to draw the adamantine chariot of his two sons, the Kabeiroi. "[The Kabeiroi] rode in a car of adamant; a pair of colts beat the dust with rattling hooves of brass, and they sent out a dry whinnying from their throats. These father Hephaistos had made with his inimitable art, breathing defiant fire between their teeth, like the pair of brazenfooted bulls which he made for Aietes the redoubtable ruler of the Kolkhians, with hot collars and burning pole. Eurymedon [one of the Kabeiroi] drove and guided the fiery mouths of the ironfoot steeds with a fiery bridle." Philon of Byzantium (c. 280 BC - 220 BC). Known as Philo Mechanicus. Pneumatica - on devices operated by air or water pressure. Repeating Crossbow: Philon's works also contain the oldest known application of a chain drive in a repeating crossbow. Two flat-linked chains were connected to a windlass, which by winding back and forth would automatically fire the machine's arrows until its magazine was empty. 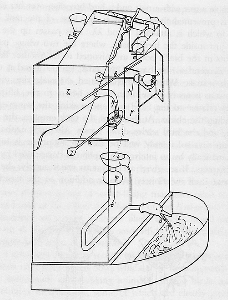 Escapement Mechanism: (Image, right) In his Pneumatics (chapter 31) Philon describes an escapement mechanism, the earliest known, as part of a washstand. A counterweighted spoon, supplied by a water tank, tips over in a basin when full releasing a pumice in the process. Once the spoon has emptied, it is pulled up again by the counterweight, closing the door on the pumice by the tightening string. 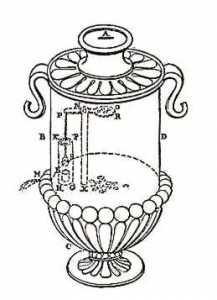 Remarkably, Philon's comment that "its construction is similar to that of clocks" indicates that such escapements mechanism were already integrated in ancient water clocks. Alarm Clock: The Hellenistic engineer and inventor Ctesibius (285–222 BC) fitted his clepsydras with dial and pointer for indicating the time, and added elaborate "alarm systems, which could be made to drop pebbles on a gong, or blow trumpets (by forcing bell-jars down into water and taking the compressed air through a beating reed) at pre-set times" (Vitruv 11.11). 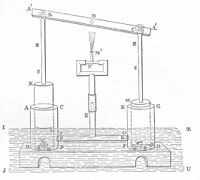 Compressed Air Cannon: Ctesibius of Alexandria invented a primitive form of the cannon, operated by compressed air. 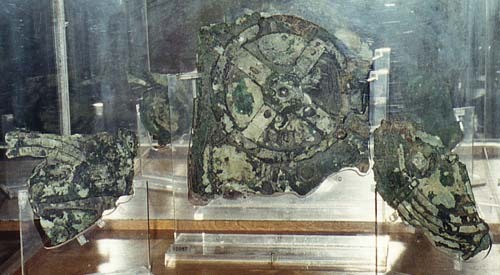 The Antikythera mechanism is an ancient analogue computer designed to calculate astronomical positions. The construction has been dated to the early 1st century BCE. It is now known to simultaneously calculate both the Metonic and Saros cycles through accurate measurements of the sun and moon. Other planetary inclusions are suspected. Heron was a Mathematician, Physicist and Engineer who lived c. 10-70 AD. He produced at least three texts, Pneumatica, Mechanica and Automata, that testify to the existence of hundreds of different kinds of machines capable of automated movement. His descriptions are a clear indication that ancient Greece was incorporating the idea of automata (mechanical devices) into their lives. 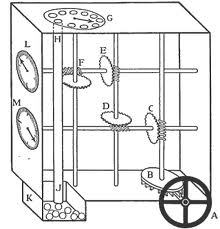 Pneumatica, a description of over 80 mechanical apparatus working on air, steam or water pressure, including the hydraulis or water organ, a fire extinction apparatus, automata that provide water if a coin is inserted and the first steam engine (Aeolipile) amongst others. Automata, a description of machines which enable wonders in temples (thaumata) by mechanical or pneumatic means (e.g. automatic opening or closing of temple doors, statues that pour wine, etc.). Belopoeica, a collection of war machines. The original manuscript did nor survive but medieval handwritten copies exist. The Aeolipile: (Steam turbine - 'Hero Engine'): Heron described a mechanism that was driven by steam, the name translates to "the ball of Aeolus"; Aeolus being the Greek god of the wind. 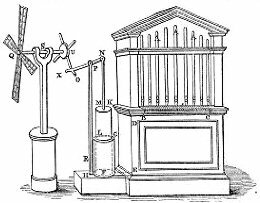 Pre-dating Hero's writings, a device called an aeolipile was described in the 1st century BC by Vitruvius in his treatise De architectura; however, it is unclear whether it is the same device or a predecessor, as there is no mention of any rotating parts. Typically, and as Hero described the device, the water is heated in a simple boiler which forms part of a stand for the rotating vessel. Where this is the case the boiler is connected to the rotating chamber by a pair of pipes that also serve as the pivots for the chamber. The Water Pump: The first water pumps were probably designed by Ctesibius, as Heron frequently mentions his earlier works in his treatise. The force pump was later widely used in the Roman world for fighting fires. A statue that poured wine: He is said to have made an automata maid that would fill a cup with a mixture of wine and water when the vessel was placed in her hand. When you put an empty cup to the robot's left hand (normally the left hand was extended), then it was starting to move down (from the cup's weight) towards the stable right hand, which was holding a Oinochoae (a vessel containing wine). When the hand was reaching at the Oinochoae the automatic machine was able to fill the cup with the desirable quantity of wine. Next, the robot was pouring water in the cup mixing it with the wine (the wine in ancient Greece must have been very strong and therefore it needed rarefaction). The power supply for the wind-driven organ relies on the transfer of motion from the “broad arms like the sails of a wind-mill” to the piston mechanism. The arms are attached to one end of a rod, which is supported such that it turns freely. As the arms turn in the wind, the rod conveys a rotary motion to a gear-like pegged disk fitted tightly on the opposite end. 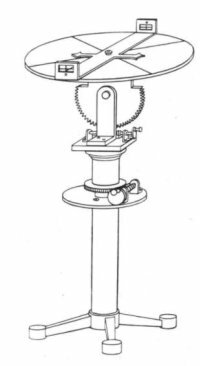 The revolving pegs make contact with a lever attached by a pin to the piston rod, causing the piston to be raised as each peg engages the rod mechanism. When the peg advances beyond the lever, the lever is released and the piston descends in the cylinder. The falling piston compresses the air, forcing it out into the base of the cylinder, up through a connecting tube, and into the box on which the pipes stand. As the key mechanism is activated, air is released into the pipes, causing “the sound of a flute” to be produced. To assure a steady supply of air, the windmill frame can be turned directly into the prevailing wind. the wind-powered organ is the only known documented windmill type mechanism in antiquity. Wind power does not reappear in Western civilization until the twelfth century. ....from an historical point of view, these instruments incorporate a manual keyboard, which as an artifact seems to be without precedent. Finally, the gear-like mechanism of the pegged disk attached to the windmill shaft is designed to transfer power from the rotating shaft to the reciprocating piston, thus converting circular to reciprocal motion. The First Automatic Vending Machine. When a coin was introduced through a slot on the top of the machine, a set amount of holy water was dispensed. When the coin was deposited, it fell upon a pan attached to a lever. The lever opened up a valve which let some water flow out. The pan continued to tilt with the weight of the coin until the coin fell off, at which point a counter-weight would snap the lever back up and turn off the valve. A coin is inserted in A and lands on the receiver R causing it to fall. This action would raise the other side of the lever P to rise opening the valve and allowing water to flow out of the spout M. The coin would slide off of the receiver and the valve would close. First Programmable Mechanism: Sources suggest that Heron created the first programmable robot as a device to entertain audiences at the theatre. In about 60 CE, he constructed a cart with rope wrapped around two independent axles, with a falling weight to provide power. Using pegs projecting from the axle, Heron could vary how the rope was wound around the axle, allowing the robot to change direction and move along a pre-programmed course. This primitive mechanism is very similar to a modern binary computer language; old fashioned punch cards operated on exactly the same principle. According to accounts, the device was controlled by a series of ropes with knots tied in them. As the rope was pulled through the device, the knots moved levers which caused actions to happen on the miniature stage. Heron used the same system of ropes, cylindrical axles and knots to create a mechanical play of almost 10 minutes in length, including dropping metal balls onto a sheet of metal to resemble thunder. Hero's Peri automatopoietikes, demonstrates that this theatre was actually programmable. Schematics for automatic doors to be used in a temple with the aid of steam power. (2) Heron designed an automatic temple door opener, which used heat and pneumatics to open a set of temple doors. To open the doors, the priest lit a fire on the altar, heating the air within and causing it to expand. This expansion in volume forced water out of the sphere and into the bucket, which moved downwards under the extra weight. This bucket was connected to a rope coiled around a spindle and, as the bucket moved downwards, this spindle revolved, making the doors open. Odometer; An odometer is a device used for indicating distance travelled by a vehicle. Vitruvius around 27 and 23 BC describes such a device and Hero also describes an odometer in chapter 34 of his Dioptra. Chariots with wheels of 4 feet diameter turns exactly 400 times in one Roman mile. For each revolution, a pin on the axle engage a 400 tooth cogwheel, thus making one complete revolution per mile. This engages another gear with holes along the circumference, where pebbles (calculus) are located, that drop one by one into a box. The number of miles travelled is given simply by counting the number of pebbles. The Dioptra: (Image, left) was a practical invention of Heron that became a foundation of surveying as the Ancient Greeks built sprawling cites and erected great temples and monuments. It also became a mainstay of the Greek astronomers, allowing them to judge the position and elevation of celestial bodies.